Middle School Girls Win League Championship! 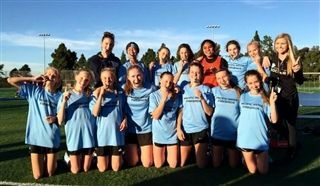 Congratulations to the Pacific Ridge Middle School Girls 'A' Soccer Team on winning the 2016 South Coast Middle School League Championship! The team capped their undefeated season with a 5-0 victory against Horizon Prep during last Wednesday's playoffs and a convincing 2-0 victory against Francis Parker in the championship game on Thursday, February 4th. During the course of the season the Firebirds gave up ZERO goals, while scoring 62 goals! "I am so proud of their hard work, dedication, and the way they played as a team," said Coach Brooke Hartley.